If the loads transmitted by the columns in a structure are so heavy or the allowable soil pressure so small that individual footings would cover more than about one-half of the area, it may be better to provide a continuous footing under all columns and walls. Such a footing is called a raft or mat foundation. Raft foundations are also used to reduce the settlement of structures located above highly compressible deposits. Since rafts are usually at some depth in the ground, a large volume of excavation may be required. If weight of the excavated soil is equal to the weight of the structure and that of the raft, and the centres of gravity of excavation and structure coincide, settlement would be negligible. Where complete compensation is not feasible, a shallower raft may be accepted if the net increase in loads in small enough to lead to tolerable settlement. A raft foundation may be rectangular or circular and may be with or without an open as shown in fig.1 and fig.2. 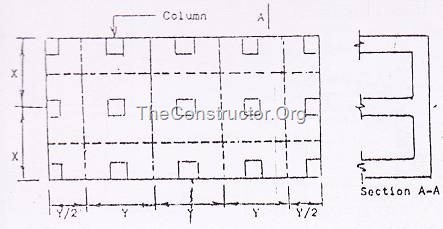 If the columns are equally spaced and loads are not very heavy, a raft may be designed as having uniform thickness. The conventional design of such a raft consists of establishing its dimensions, from which the soil pressure at various locations beneath the slab may be computed. The raft is divided into a series of continuous strips centered on the appropriate columns and rows in both directions as shown in fig.3. The shear and bending moment diagrams may be drawn using continuous beam analysis or coefficients for each strip. The depth is selected to satisfy shear requirements. The steel requirements will vary from strip to strip. This method gives a conservative design since the interaction of adjacent strip is neglected. If the columns are equally spaced and their loads are equal, the pressure on the soil will be uniform, otherwise moments of the loads may be taken about centre of the base and pressure distribution determined. Since the equations for this are usually derived for a rigid member and a raft in general is not a rigid member, the pressure and resulting internal stresses may be seriously in error if the eccentricity is very large. 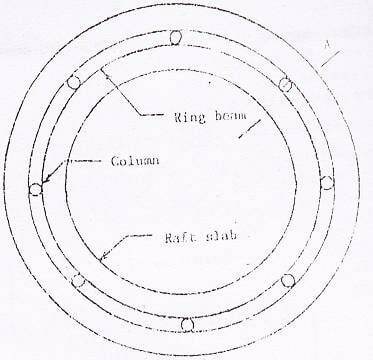 The weight of the raft is not considered in the structural design because it is assumed to be carried directly by the subsoil. 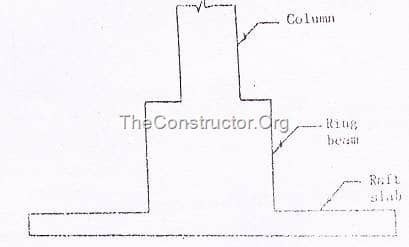 Raft may be ribbed where the column spacing is irregular or for economy in using a relatively thin slab over most of the area as shown in fig.4. Alternatively, rafts may be thickened at the column locations for economy and depth should be made sufficient to resist shear. 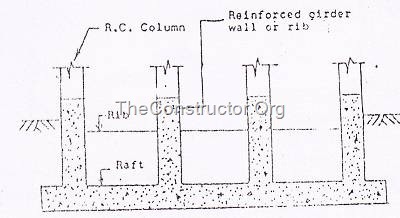 A ribbed raft foundation consists of a slab acted upon by upward soil pressure at its underside and supported by beams from column at its top which balance the upward pressure with downward column loads. It is a similar to a floor slab resting on a system of beams and columns. The portion between beams is designed as a conventional one way or two way slab. If the beams are deep, they should be designed as deep beams.